The following is an exerpt form a new report, Enterprising States, released this week by the U.S. Chamber of Commerce and National Chamber Foundation and written by Praxis Strategy Group and Joel Kotkin. Visit this site to download the full pdf version of the report, or check the interactive map to see how your state ranks in economic performance and in the five policy areas studied in the report. The full report include a case for the nation beating the "new normal" and lists of best-performing states by policy area, and an index to select the top 10 states likely to continue to grow. Troubled by economic stagnancy and high unemployment, many pundits and policy makers are referring to the U.S. economic malaise as the “new normal,” claiming that we have reached both technological and economic plateaus. To be sure, the relative weakness of the current recovery – arguably the weakest in contemporary history – does support the “new normal” thesis. Not everyone, or every state, accepts the notion of inevitable, slow growth and gradual decline. From the onset of the recession, some states have largely avoided the downturn. By the end of 2011, six states – North Dakota, Wyoming, Alaska, Utah, Texas, and Montana – showed more than 8% job growth over the past decade. Another 22 had shown some, although less robust, employment increases compared to 2001. More important still, nearly every state enjoyed some overall private-sector job growth between January 2011 and January 2012. Most critically, growth has spread to many states hardest hit by the recession, including Michigan, California, and Florida. The strongest job growth continued to take place in other states, notably Louisiana, Oklahoma, Texas, Utah, and North Dakota. The new geography of growth reflects many of the intrinsic strengths of the U.S. economy often missed by many policymakers and commentators. After a brief lapse, the country is already outperforming all its traditional high-income rivals in Europe, as well as Japan, as it has done for most of the past two decades. Key U.S. assets include surging agricultural and energy production, the general rebound in U.S.-based manufacturing, and unparalleled technological supremacy. The country remains attractive to both foreign investors and skilled immigrants. For the U.S. to be successful, this new geography of growth needs to extend across the 50 states and expand for long enough to significantly lower the high rate of unemployment. This will require something more than a single-sector focus. Attention must be paid to both basic and advanced industries since innovation and technology growth alone cannot turn around most regions and states. More than anything, governments and business leaders need to appreciate how these sectors interact with each other. To be effective across all geographies, innovation must be applied to a broad array of industries, including but not limited to computers, media, and the Internet. Innovation and new technologies are also a means to unlock the productive potential of both mundane traditional industries and the service sector. States striving to do well in this environment face many barriers to fostering economic growth and creating jobs. These barriers include the high level of debt in many states; a growing skills mismatch between the workforce and the jobs available within a state; and outdated regulations and taxes that serve as barriers to free enterprise. In the ebb and flow of the global economy, states can no longer rely solely on strategies of keeping costs low and providing incentives to attract footloose, commodity-based branch plants or offices. Instead, states must create the right business climate that allows companies and entrepreneurs to create 21st century jobs. Dramatic changes in the scope and scale of the global economy have significantly altered the nature of foreign competition. Jobs are the new currency for leaders across the globe, and those who can create good jobs will own the future. With 95% of the world’s customers now living outside our borders, trade with other countries is a key part of our economy that will continue to be important long into the future. Businesses need a highly skilled workforce – which includes many workers with certificates or two-year degrees – that is able to perform the jobs of a 21st century economy. States that are able to get students involved in the STEM fields – science, technology, engineering, and math – will be the most competitive. Innovation, now the essential driving force for creating and sustaining economic opportunities, is much more multidisciplinary and global in scope than ever before. Innovation and market cycle times are much shorter and continue to accelerate. This makes it more important than ever that states provide the tools, support, and tax and regulatory environments for companies to continuously innovate without onerous delays and burdensome costs that put their entrepreneurs and businesses at a competitive disadvantage. Fostering an enterprise-friendly business environment by cleaning up the DURT (delays, uncertainty, regulations, and taxes), modernizing government, and fixing deficiencies in the market that inhibit private-sector investment and entrepreneurial activity. State policies and programs that most effectively promote job creation are rooted in market reality. This means building on the existing core industries and technological advantages of a state while pursuing opportunities in growing and emerging sectors. Building on and sustaining existing economic momentum remains a key means of guaranteeing success in the future. Huge increases in food exports, domestic energy investment, a revived manufacturing sector, a burgeoning tech sector, vital demographics, and increased investment from abroad create a strong base for long-term secular recovery of the U.S. economy. Rather than facing a dismal future of the new normal, we may actually be on the cusp of a recovery that could become one of America’s finest moments. The key to making this work, for the states and the nation, lies in policies that promote broad-based, long-term economic growth. 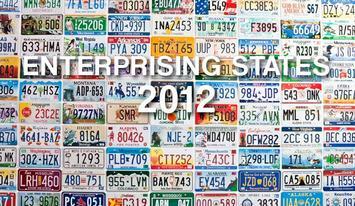 Download the full report, or read the Enterprising States 2012 coverage at the National Chamber Foundation blog. Praxis Strategy Group is an economic research, analysis, and strategic planning firm. Joel Kotkin is executive editor of NewGeography.com and author of The Next Hundred Million: America in 2050.